The url http://beer.ericshepard.com is not currently working. GoDaddy changed my web server, which meant an IP switch. GoDaddy kindly switched the DNS entry for http://www.sheppybrew.com and the other primary domain names that were pointing to that same web server, but they didn't switch the DNS entries for any sub-domains, which meant I needed to manually switch the IP address of beer.ericshepard.com. I thought I did switch it. In fact, I am looking at the DNS manager right now, and it looks to me like beer.ericshepard.com should be pointing to my web server, but browsing to it gives me a not found error and pinging it points to the old IP address. Of course, this is not really a big deal since anyone can get there by using http://www.sheppybrew.com (plus there are few people who even go to that site) , but there are quite a few old links out on the internet that point to pictures or pages with the address beer.ericshepard.com . I probably would not have even noticed except I was looking at old posts on this blog about Buckwheat's Belgium Pale Ale and noticed that a picture was missing. I may have to contact tech support on this one. Bummer. Hopefully by the time you read this post, it is taken care of. Speaking of Buckwheat's Belgium Pale Ale. Inventory is running low, so I think I'll be brewing another batch soon. The Beer Model really goes through this beer fast. You may recall that last time I brewed this, I did a double batch and fermented half with the fermentis S33 yeast (which is my standard yeast for this beer) and some of the T58 yeast (which yields more Belgium flavors). We agreed that we both enjoy the beer better head-to-head with the S33 yeast. This time I am going to compare S33 (the reigning champion) with US05. I am pretty sure that it will be a little more difficult to tell a difference between these two yeasts. My experience tells me that US05 will probably attenuate more fully with a cleaner ester profile than S33. If she can tell the difference, my guess is that she'll still prefer S33, but until we do the taste test, there is no way to know for sure. After this experiment, I have one more yeast I may want to use to challenge the winner. Many of my beers ferment with a harvested version of American Ale II (Wyeast Labs #1272). So, far, I've really enjoyed all the beers using the AAII yeast and I sort of consider it my "house yeast". I have said before that Buckwheat is Phat & Tyred's little brother. I suspect that if Buckwheat used the same yeast the two beers would be even closer, and maybe extremely difficult to tell apart. Even if AAII wins, I may not use it in Buckwheat just so the beers are truly significantly different. Anyway, we are getting ahead of ourselves a bit. That whole thing is way down the line. I am running dangerously low on empty bottles. Anyone have empties they want to drop off? If not, anyone what to help me drink some beer? So, I am making an American stout. 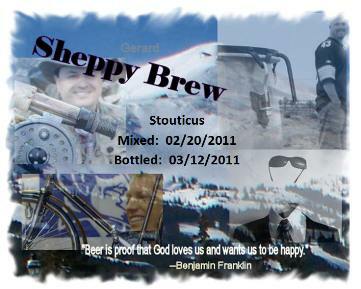 See Stouticus American Stout on the SheppyBrew web site for the recipe and the story behind why I am making a stout. I don't make a lot of stouts. The main reason this one is a stout is because I had a request that included the name "Stouticus". 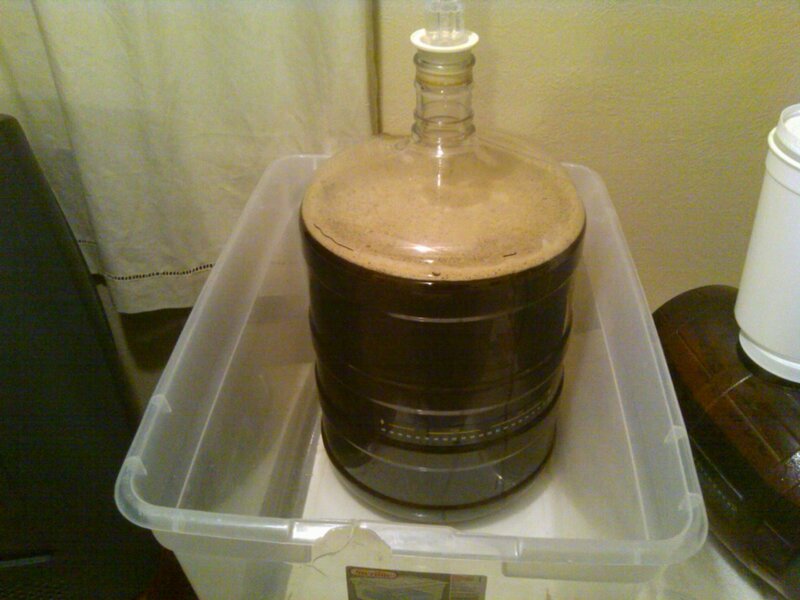 I didn't think it would be proper to brew anything but a stout for a beer named Stouticus, so I brewed a stout. I developed the recipe making sure to use ingredients from McMenamins Terminator Stout (which is part of the story you can read about on the web site). When I went to the LHBS, though, I tasted black barely and thought it's roasty dryness was too intense to use as much as I had originally planned. I guess you can say I wimped out, but at the time I thought it was a good decision. I still do think the decision was sound, but sort of think I should have just "gone for it". After tasting the wort, I just didn't get a bunch of the dry roast flavors that stout lovers like. It will be a good stout, for my taste it will be a great stout (most likely). It just won't have as much "roasty" flavors as a true American stout lover would expect. Luckily, I know the brewer, so if I decide it needs something, I'll just have it brewed again. This was my second time using my wort chiller. Awesome. This was also my first time using my new 6 gallon better bottle carboy. Awesome as well. The brew day started early today. I got my mash started at 6:30 today and let it do its thing through church. I started sparging when I got home. This is something I've been doing quite a bit lately. I don't think there is a disadvantage (or advantage for that matter) in the long mash. It is a very convenient way to multi-task. Enzymes do all that work and don't need me to them how to do their job. I might as well be off doing something else. I got a "stuck-mash" this time. It wasn't a big deal because I had planned 3 sparges and it was the last one that got stuck. By that time, there were enough sugars in the collected wort that I simply added water to the boil and my specific gravity into the boiler was fine. I do want to figure out what is going on, though. My sparge last weekend was slow at the end too. I wonder if the long mash might be doing something that gums up the works. Don't know, but at least it turned out today. The boil went as planned. I ran out of propane in the middle of the boil, but I had anticipated that and had another propane tank ready to go. The wort didn't even stop boiling. The wort chiller did its magic wonderfully again. The pitch temperature was right at 62 after less than 20 minutes of cooling. It also gave me an excuse to water our front yard tree. I'm so glad that my wife got me the wort chiller for my birthday. I ended up diluting the wort at the end because of a high OG. My volume was right on originally. I added about .5 gallons and ended up with 5.5 gallons in the ferementor. I pitched the starter that I had made this past week. I never really ever noticed the starter fermenting, but this morning, I took an FG reading and it had indeed fermented quite low. It also tasted really good. I like the nutty, almond flavor that the WY1272 imparts to beer. I don't know how much of that nutty flavor will come through in the final beer this time, since it is such a dark beer. I guess I'll find out. One thing I don't know about is how to go about keeping fermentation temperatures low in the bigger fermentor. Right now, I'm simply keeping the carboy in our spare bedroom in a bin with a couple of ice bottles covered with a towel. This probably won't work well in the summer. It should be fine for Stouticus this time, though. Anyway, it was another great brew day. Hope I have enough bottles to handle all this beer. But, that is another story. TommyHawk came in with the most votes. WWW came in with the least amount of votes. My wife voted for WWW. Because I am whipped, I made WWW, despite the fact that it got the least number of votes. This weekend, WWW was ready to bottle. This freed up two Mr. Beer fermentors. 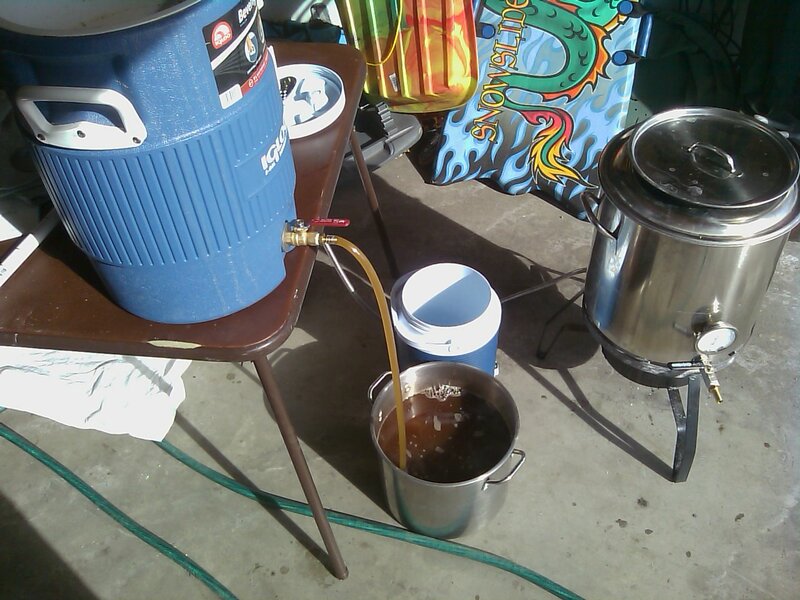 I got a new wort chiller for my birthday last weekend. The weather was supposed to be beautiful. I even got a shipment from Northern Brewer which would included my first 5-gallon carboy (although in the end, I decided to save its maiden brew session for next weekend). The beer I had at dinner on my birthday was the New Belgium seasonal Mighty Arrow APA (which is what originally inspired the Tommy Hawk recipe). All these factors could only combine to mean 1 thing: time to brew a batch of TommyHawk APA. Friday afternoon, I stopped by The Brew Hut to get the ingredients for this weekend's brew. Bottled up WWW this weekend. 39 12 oz bottles; 1 22 oz bomber; 2 1 liter bottles; 1 2 liter growler. I feel a little dishonest calling this an APA. It is sort of in that gray area of being a hoppy / high alcohol APA, or a lower-end American IPA. Technically, though, I think IPA would be a better description of what it truly is. If you are ever drinking one and feel cheated by the name, feel free to ask for your money back. I will gladly give you double what you paid for it. Regardless (notice that I didn't say irregardless), Tommy Hawk is a nice hoppy beer. It also has the best art-work of any of my labels. My oldest son drew that Blackhawks logo for me. He was only 6 at the time. He's a much more talented artist than his father. This is my first all-grain batch of Tommy Hawk. It is also the first large (large compared to my usual batch size. regular compared to most brewers) batch of this beer. 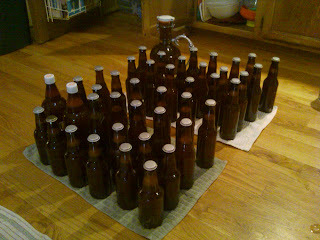 My plan this time is to split the batch into two Mr. Beer fermentors. I'll dry-hop one half and leave the other without. A nice little experiment to see what the dry hopping actually adds. I started the brew day before going to church. Right when I left, I measured the temperature at 154 (exactly what I wanted). Weirdly enough, it was at 160 when I got home 2.5 hours later. So, my mash was probably hotter than I wanted. Oh well. I measured my SG from the start of the boil at 1.055 in about 7 gallons of water. I was expecting 1.048 going into the boil. Beer Smith tells me my mash efficiency at this point was a bit over 95%. I know that can't be right. I guess I must have measured something wrong. Did I grab too much 2-row on Friday? Don't know. The wort chiller that my wife got me for my birthday worked fantastic. 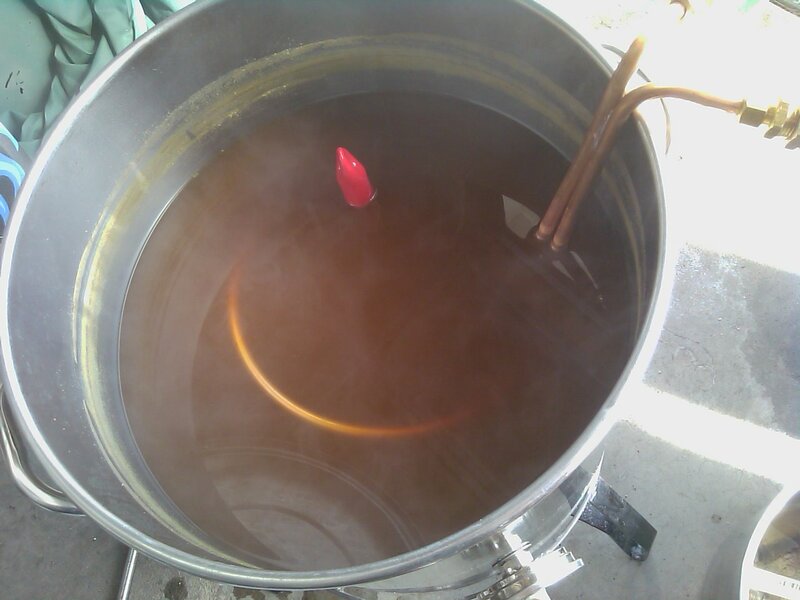 The wort went from boiling to about 80 in 10 minutes and was in the low 60's after about 20 minutes. That is much better than the ice bath. I am glad my wife was nice enough to get me one. I ended up diluting the wort quite a bit at the end of the boil. Even so, my OG ended up much higher than I intended. I guess the good news is that I seem to be getting bigger beers than I intend rather than smaller ones, and that can't be a bad thing. The weather was sunny and mid-60's but we still have quite a bit of snow. The boys and I built a snowman after my brewing day was over. Yes, Tyler is dressed in PJ's and snow boots. Connor is a bit more reasonably dressed. 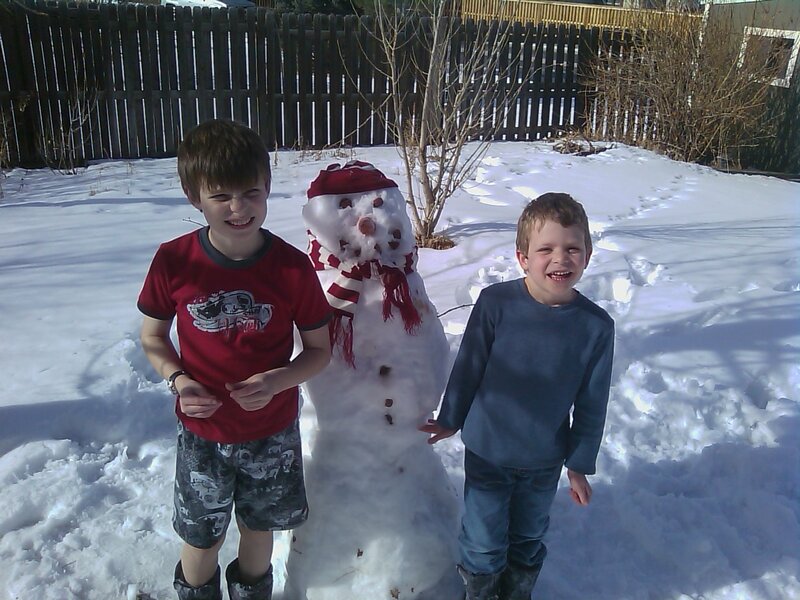 Isn't Colorado weather fun? Anyway, it ended up to be another successful brew day. Stop it. Stop it. STOP IT! Stop typing "your" when you mean "you're". Just stop it! For goodness sakes, I know most of you passed 2nd grade. It drives me crazy when people get that mixed up. I certainly am not grammatically perfect in everything I type, but I have noticed an epidemic in your / you're confusion lately. Between facebook and twitter and various online forums, I see it all the time. I don't usually call anyone on it, but I might start. Please stop it so I don't have be a jerk. YOUR brain should be able to comprehend the proper use of the word. YOU'RE an idiot if you use your when you mean you are. I suppose some of the problem is that we live in a world of text messages and twitter where the number of characters you type are limited. But, quite honestly, I would rather you type UR to mean "You are" than "your". While you're at it. Please stop typing "their" when you mean "there" or "they're". Stop typing "to" when you mean "too" or "two". Stop. And, I really would prefer you stop typing i.e. or e.g. unless you actually know the difference. It doesn't bother me so much that people don't know that difference, but if you choose to use one or the other, at least look it up so you know which means which. And, while I'm at it, irregardless is not a word at all. Don't use it. You really mean regardless, so just say regardless. Thanks for letting me get that all off my chest.